The primary difference is whether one looks to compromised, often corrupt politicians to create social change or whether one looks to organizing working people to achieve their own liberation from inequality. It’s where you place your trust & commitment in practice. There can be no possible objection under democracy (though the rigged US electoral system is definitely not that) to people voting as they see fit, nor to justifying (or not) their choices. But do they have to explain away the rotten politics of their chosen candidates? You can choose Sanders or Clinton but you have to be honest that a lot of rightwing rubbish comes along in that choice. Or do war, Israeli apartheid, refugee rights mean nothing? Finally a candidate has entered the presidential campaign who brings dignity to what has become a comic travesty & mockery of democracy. According to CBS News, Vermin Supreme placed fourth as a Democrat in the New Hampshire primary last night, with 200 votes. Some claim our man Vermin is a political satirist & not a serious candidate but who would dare say that with a straight face after viewing the Republican line-up? Or after listening to one of Trump’s speeches? Or after watching Clinton & Sanders play the populist card? Incidentally, someone ought to analyze Trump’s use of hand gestures. There’s some derangement going on there. 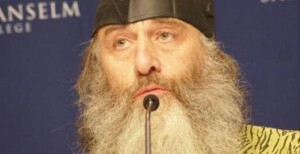 This is Vermin’s third run for president but first time as a Democratic candidate. We cannot call for a vote for him on that score alone but also because he demanded of Ted Cruz that “terrorists be waterboarded with fluoridated water.” As much as we detest the politics of Clinton, Sanders, & the entire GOP line-up, we cannot approve of waterboarding them. We prefer due process prosecution & life sentences at Fort Leavenworth federal prison. The UN refugee agency (UNHCR) reports today that 68,023 refugees have reached Greece from Turkey & that 403 have drowned so far this year. That refugees continue to drown is testimony to the criminality & barbarity of EU refugee policies. Allowing people, including children, elderly, infirm, disabled, to set sail in plastic rafts on winter seas instead of transporting them on ferries is monstrous–& that isn’t even the half of it for EU barbarism. Russian & Syrian bombers are on a massive bombing siege over the Syrian city of Aleppo forcing tens of thousands to flee to the Turkish border about 50 kilometers (31 miles) away. (So much for the repugnant view that Russian bombers are playing a progressive role!) At this point, between 35,000 & 50,000 fleeing refugees are crammed into tent & container camps in rain & freezing temperatures on the Syrian side of the Turkish-Syrian border. They cannot cross to get away from the bombing because Turkey is enforcing its devil’s pact with the EU to shut down the flow of refugees by force. In return for holding thousands of refugees in living hell, Turkey will get consideration for EU membership–a hangman’s noose for working people which has economic benefits for the ruling elite. German Chancellor Angela Merkel, functioning as thug-in-chief for the EU, was in Turkey to enforce the EU agreement & said she was “not just appalled but horrified” by the suffering caused by Russian bombing in Syria. It’s a deft shifting of focus from the EU’s refugee policies to Russian military barbarism. All parties are of course at fault for this crisis but that does not ameliorate one iota the criminality of Turkey & the EU in closing down the borders & allowing up to 50,000 people to be a breath away from massive bombing. Other EU officials, including foreign policy chief Federica Mogherini, also weighed in with the alligator tears about the humanitarian crisis on the Syria-Turkey border. Mogherini said there was a moral, if not legal, duty to provide protection to the refugees. Is that how she sees tent & container camps less than an hour from carpet bombing? But of course nothing that comes out of Mogherini’s mouth means squat when she is the chief executioner of refugees fleeing from the north African coast & chief promoter of the military operation against them. There is a complete news blackout on refugees fleeing from countries on the African coast. But the UNHCR reports today that 6,029 have reached Italy. There is no elaboration of the numbers who have drowned, of how they have been prevented from leaving the coast, of what happens to them when the EU naval operation intercepts them. There is no elaboration of what happens to the 6,029 who arrived in Italy. Will they be granted asylum? Will they be deported? And what about the 5,000 unaccompanied children who went missing after being processed in Italy, according to Europol? The crimes being committed by the EU against refugees are monstrous but we cannot be daunted in our solidarity. How working people respond to this crisis is of the essence in deciding whether we stand for human rights without flinching or allow neoliberal capitalism to drag us to greater depths of barbarism toward each other. 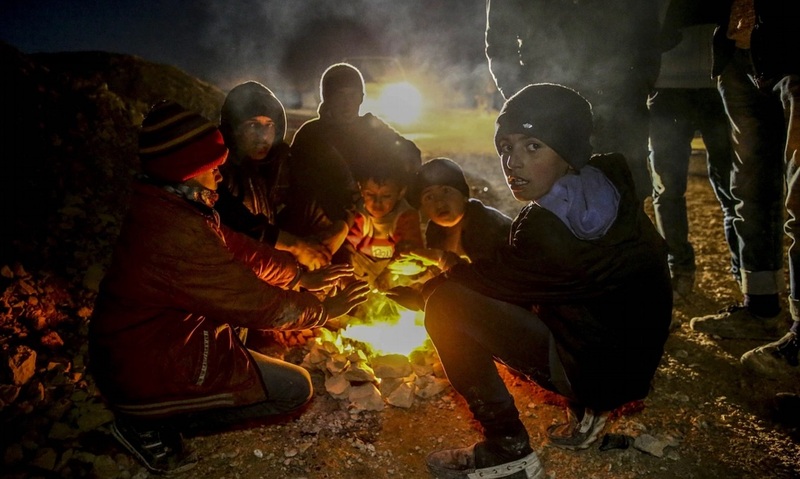 These young children are warming themselves at a refugee camp about 50 km from the bombing siege in Aleppo. Immigration is more than a human right; it is a political imperative.